﻿ Dynamics 365 helps for the Non-profit organizations to steer greater impact! 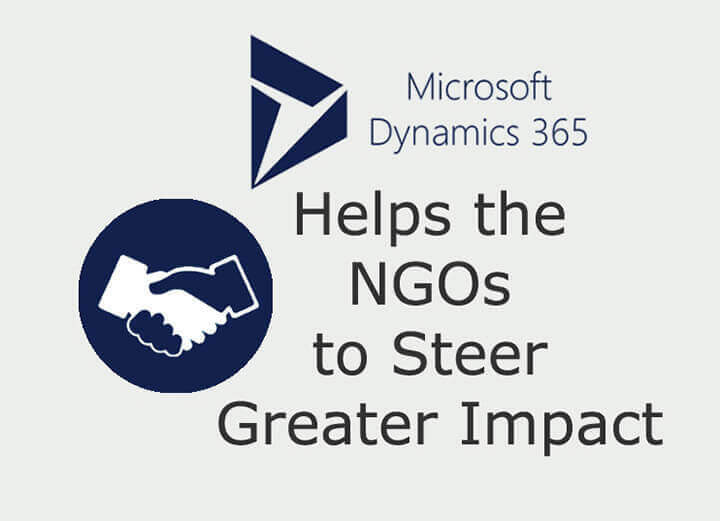 Dynamics 365 helps the NGOs to steer greater impact! You Are @ >> Home >> Articles >> Dynamics 365 helps the NGOs to steer greater impact! Microsoft Dynamics 365 offers great potential to simplify the line-of-business, and enables the company to boost theagility of the organization and lessen the costs. It has a host of features that can be used by the business to manage and amplify the customer relationships. At the same time, it also benefits the company by offering them the ways to strengthentheir customer bond. Be it the customer support team or the marketing team, the new version of the CRM, Microsoft Dynamics 365 has something for everyone. However, the most interesting thing is that Dynamics 365 has the potential to enhance the operation of a non-profitorganization as well. NGOs get an option toamplify their missions as well as drive better impact. Most of the non-profits are aimed around results-oriented passionate people who are there with the mindset to help to others,however, the pressure is high on them as it is absolutely not to steer useful and impactful outcomes at the speed and scale required. As per a recent report more than half of thenon-profitworkers are feeling the heat because of the ever-increasing, incontrollableamount of work. Resource-limits are absolutelynot the sole problem, because of the intricate success capacity, tight budgets as well as theancient workflow and methodologies, these burdenssignify that the sector requires more support and advancement now more than ever. Here comes the role of Microsoft Dynamics 365. Basically, a CRM is required by the non-profit in order to significantly lift the pressure off the third-sector. For the NGOs, despite of‘customers’, the relationship management means ‘promoters’, ‘beneficiaries’ and ‘contributors’. Dynamics 365 allows the charityto capture interactions of the key relationships. It also helps the NGOs to easily track the grants, donations, as well as the status of the resources in just one single integrated solution. Dynamics 365 helps the non-profits to curate the system in order to help it function in line with all of the organizations’ processes. Every NGO has distinguished workflows across all the major tasks, from fundraising to people management and partner promotion, and with the help of Microsoft Dynamics 365, the technology smoothly fits around theorganization’s operations, and not vice versa.Plus, it is also quite significant to understand that once the system applied for the organization’s particular requirements, it doesn’t really signify that you’re pushed to the corner. In fact the software has the capability to grow and change in order to fulfill the requirements of the expanding non-profit. Furthermore, the ability of pre-built amplifiers within the solution make bespoke personalizationunbelievably efficient. Just imagine how Microsoft Dynamics 365 with act as a building block, with everypersonalization, the solution is expected to becomes more solidin order to manage the developments within the NGO. Intelligent marketing is certainly the core and necessity of each and every successful NGO. There are a plenty of highly useful email marketing as well as marketing automation functions in the Microsoft Dynamics 365 development that can help to enrich and boost the marketing effort, however, one of the most impactful feature isClick Dimensions. The marketing experts can create their own marketing lists inside MicrosoftDynamics 365, and then they can use the Click Dimensionsprogram to not just send emails but to also track the performance by tracing the parameters like, heat maps, responses, click-through rates, and a host of other very useful marketing KPIs, which the board will surely love. Plus, also offers the marketers an extra edge over other tools, as the marketers can craft the marketing campaigns as per their need and want as well. It is very important for every NGO to have a holistic prospective of the overall relationship landscape. This includes both the internal as well as external relationships. Dynamics 365 solutionsis capable of supporting the nonprofits to capture and centralize all of their interactions with either donors, members, contacts, donors orvolunteers to make sure that each and every department within the NGOis perfectly working on a single system, as a unified team. This is done to ensure that the services are offered at optimum efficiency. Even the NGOs generally find themselves functioning on at least two or even more software systems with minimum two silos of data. Hence, Dynamics 365 saves them from the hassle of managing the data on different platforms. Plus, it offers a host of benefits to enhance their overall functions as well.